Phoenix Landing hosts educational seminars featuring speakers with special knowledge or experience related to the welfare of parrots. Come and learn more about how parrots think and behave, how you can be a better parrot guardian, and what we can all do to improve the lives of parrots both in captivity and in the wild. You can also meet some of our adoptable birds at most of our events, from parakeets to macaws. However, for health and safety reasons, we ask that you do not bring your birds. We strive to minimize the spread of disease. ﻿﻿No registration or fees for our monthly classes are required, unless otherwise specified, so please join us often! Of course we appreciate donations to help cover our facility and speaker costs, and sometimes we will even suggest one. However, we want everyone to come regardless of money. Please take the time to learn something new for your parrot. NOTICE: Classes at The Landing in Alexander, VA and at SEAVS in Fairfax, VA involve stairs. Thanks for understanding. ﻿When we bring a parrot into our lives, from parakeets to macaws, we are offering them a place to call home. What does home mean? For a parrot it might mean a place to be safe, be healthy, have a sense of family, and be provided positive opportunities to live and thrive. This class will address what each of these means to a bird, and give you some ideas about how to continue providing the good life for your bird. [also satisfies our adoption process requirement]. Veterinary Technician, Nicole Quagliata, will give us some tips for preparing for those unexpected emergencies, as well as ways we can improve our husbandry skills like weighing our birds, going in a carrier, or medicating. Following that, we'll have a toy-making session for the birds at The Landing and we can show you some easy ways to make quick enrichment for that smart and savvy parrot! ﻿Looking for techniques to keep your parrot happy and calm? Let's explore some ideas for meeting our parrots’ many needs, including tips for keeping those bird-brains thinking and engaged. 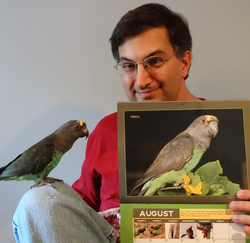 We’ll touch on many aspects of parrot care, to include: optimizing the cage and play areas; providing a nutritious and varied diet; providing clean air, sufficient lighting and exercise; discovering ample socialization opportunities; and finding techniques for mental stimulation [also satisfies our adoption process requirement]. ​Space is limited, call the hospital at (904) 256-0043 to reserve a seat.